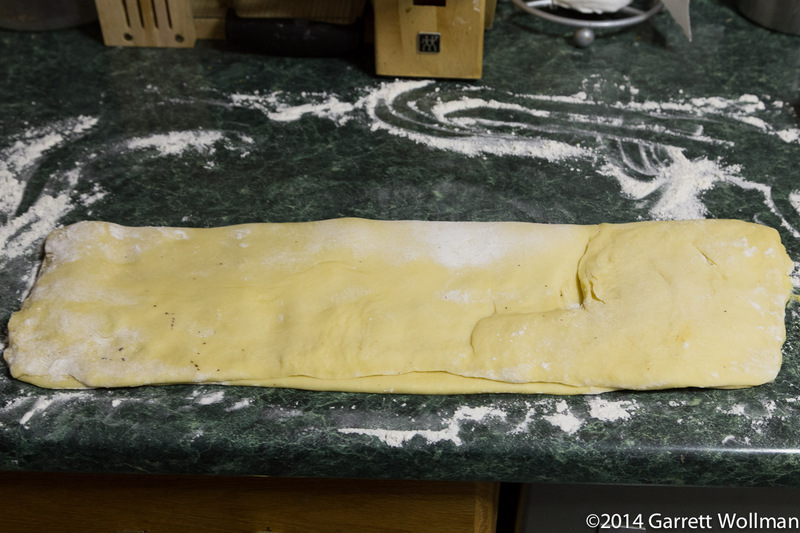 The brioche is rolled out to a 10″×20″ rectangle (or nearly so) and the entire batch of pastry cream is spread on top using an offset spatula. I took some TCHO 66% dark chocolate discs and roughly chopped them to make the chocolat part of the brioche au chocolat. The chocolate was spread (not quite as evenly as I would have liked) over the pastry cream, and then the brioche was folded over to enclose the pastry. Apparently I didn’t do a very good job of rolling out the brioche dough, as it was clearly much thicker at one end than at the other, which left the finished product a bit uneven. 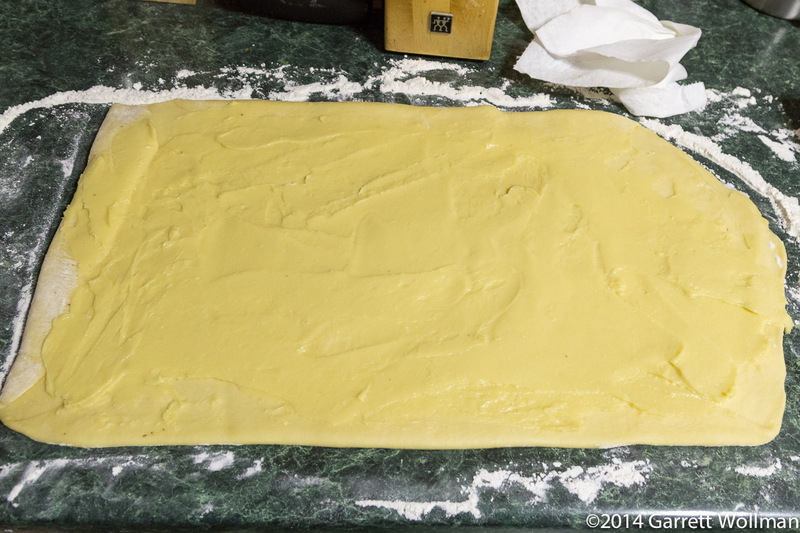 After spreading the chocolate on top of the pastry cream, the rectangle is folded in half lengthwise and sliced into individual pastries using a bench scraper. So, uh, as I mentioned before, I can’t cut anything straight without a guide. 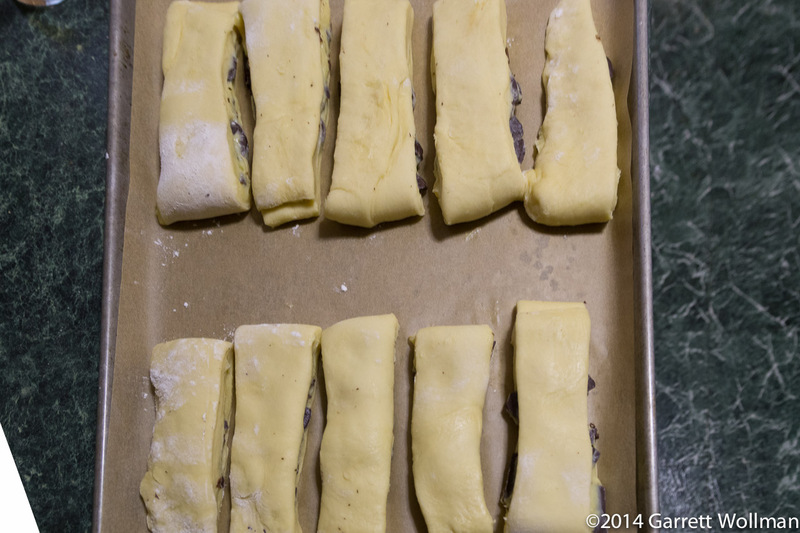 These are the ten individual brioches au chocolat sitting on the baking pan and ready to bench-proof. Since it was so warm in my kitchen I just covered them with a sheet of plastic wrap and let them proof where they sat. 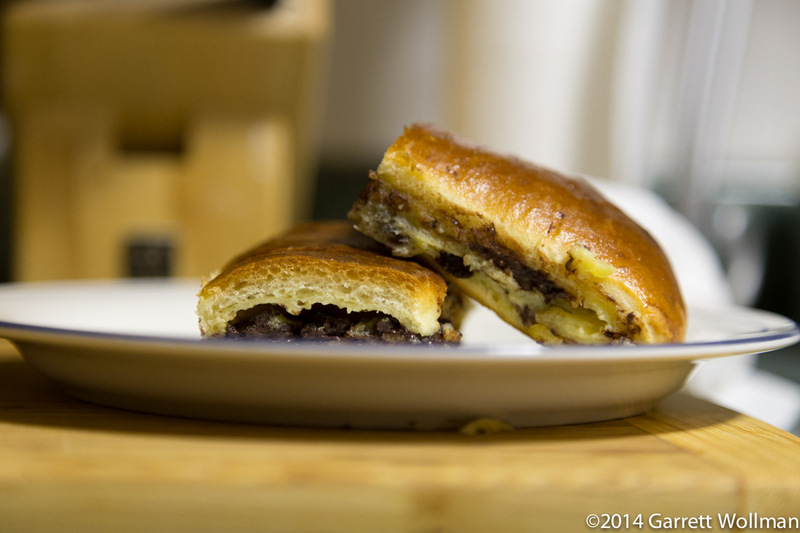 After only 30 minutes in the oven (five minutes less than the recipe called for), the brioches au chocolat were done. Of course, I let them cool for half an hour — then ate the misshapen (and underfilled) one! I wasn’t supposed to have two brioches at all, never mind so late in the day, but I couldn’t resist stacking a nice one up on a plate for the beauty shot. Look at all that chocolate! Well, this is certainly not the healthiest thing you can eat — and I can’t imagine having it for breakfast even if I was the sort of person who eats breakfast. But they are tasty, and sweet, and chocolatey — certainly on par taste-wise and calorie-wise with many popular desserts. Just don’t have them at every meal! 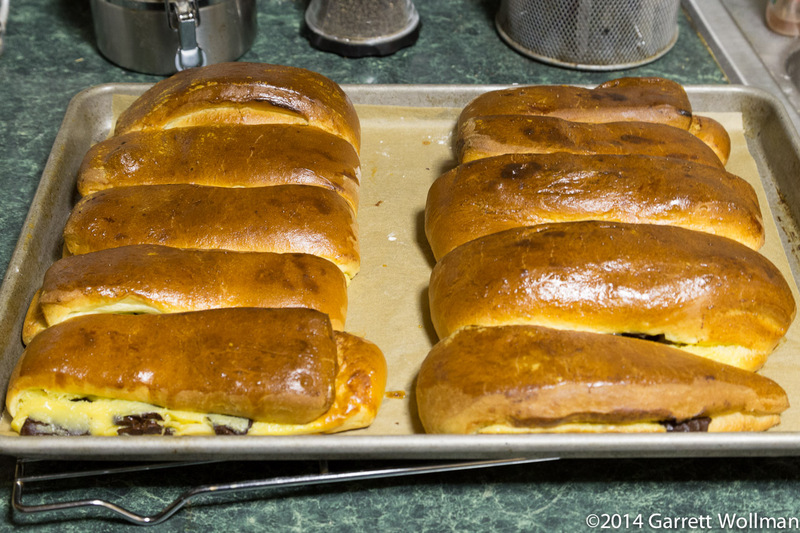 This entry was posted in Food and tagged bread, brioche, chocolate, Joanne Chang, recipe. Bookmark the permalink.